SYDNEY (Reuters) - Two scuba divers, a British man and an American woman, were rescued on Saturday after drifting for 20 hours off Australia's Great Barrier Reef after they became separated from their dive party. A rescue helicopter spotted the divers drifting about 7.8 nautical miles (12.5 km) northwest of Bait Reef, winched them aboard and flew them to a nearby resort island, police said. Police said the divers survived because they made sensible decisions and remained calm while floating in the ocean overnight. 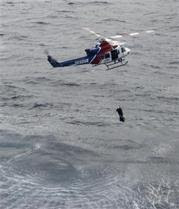 "The divers made some very good decisions throughout the evening," police superintendent Shane Chelepyhe said. "My information from talking to them is they strapped themselves together using their weight belts, they conserved energy, stayed as a pair and awaited rescue." The two, part of a party of six divers on a charter boat, became separated on Friday afternoon and drifted some eight nautical miles during the night. Police said the pair were diving in a small inlet called Gary's Lagoon when they failed to resurface as scheduled. The dive boat crew started a search, alerting police when they failed to find any trace of the missing divers. Three aircraft, including a specialised search and rescue plane with forward looking infra-red equipment, searched overnight for the pair. The search was expanded on Saturday with seven helicopters and three aircraft looking for the pair. "I'm quite surprised, they are in such great condition," a helicopter rescue official told local radio. "It was quite amazing, with over 20 hours in the ocean to not have more exposure, but I guess the wetsuits just kept them warm enough during the night. Possibly they had some fresh water on them and they didn't get too sunburnt during the afternoon."